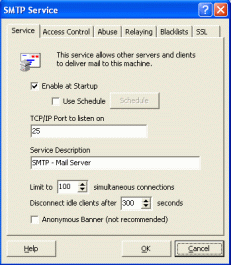 The SMTP server in Mailtraq is one of the most sophisticated available. The SMTP server is the heart of your email system. It enables you to receive mail from the Internet - from other servers - and to accept mail from your local network and other authorized users for delivery. Mailtraq is multi-threaded, with support for multiple CPUs and runs on all Windows systems from XP to W2008 Server. Mailtraq provides the power and flexibility you need, without the costs and difficulties that come with Microsoft Exchange or other alternatives. See Mailtraq SMTP server video. Whilst this may seem straightforward, the efficient execution of these tasks in the midst of multiple attack vectors makes this one of the most demanding environments. Mailtraq has the power and multi level protection you need. The SMTP server installs automatically with a safe default configuration and Mailtraq Professional provides SSL/TLS support for SMTPS. The SMTP server listens for incoming connections on port 25 (or any other specified ports), and having checked that it shouldn't be rejecting it, sends the mail to Mailtraq's mail routers, which will either place it in local mailboxes, or send it out to remote recipients. Accepting mail is easy, but knowing when to reject it is more complex, yet just as important in maintaining an operational mail server. Mail relaying, Dictionary attacks, Unverifiable return paths,Unresolvable HELO, HELO or From header claiming to be local, Large message safety, Blacklists, Whitelists, Dynamic Blacklists (DBL), and Bayesian Anti-spam control are just some of the situations the Mailtraq SMTP server handles. Many of these are aimed at preventing attacks by spammers which, if permitted, could lead to your users being impersonated, inundated with unwanted mail, and even (in the case of open relaying) being disconnected from the Internet for violation of acceptable usage agreements.